Hello again from Poland...I am sad to say that today was our last day in Poland. What an incredible experience we have all had throughout our three weeks on the Erasmus+ programme. From working with robotic arms to using Solid Edge to create our own sketches, the work experience was incredible. The work experience however was only one aspect of this incredible experience. The culture was equally, if not even more incredible. From day one, to the very final day, we were immersed in Polish culture, which I personally thought was amazing. It was such a great experience to do even simple things like going to the shops or to order food in restaurants mainly due to the language barrier. While it could be challenging at times, I thought it was great experience to be taken out of my comfort zone. On the last day of our trip we all got up at around 9am to make sure we were all ready to go to the airport on time. We were all ready at around 10am, so we decided to go and visit the square in Poznan one last time. I felt quite upset when the realisation hit me that we would no longer be in this beautiful country, with all of its beautiful culture, architecture, food and people. After our final walk around the square we went back to the apartment to collect our luggage and get a taxi to the airport. Once at the airport we checked in our bags, got a picture for our blog post, and checked out the duty free which was surprisingly not very cheap at all. Once we started queueing for the gate it really set in that we were going back to Ireland, and while I was looking forward to seeing my friends and family again I was already starting to miss Poland and all the people that we had met and befriended during our trip. The flight arrived on schedule and thankfully our luggage was already on the carousel when we got through security. We walked to the bus stop and thankfully there was space on the bus for all of us as some of the group had not booked their tickets beforehand. Once we arrived in Galway we said our goodbyes and went our separate ways the trip was officially over. This morning we got an opportunity to explore one of the oldest and the biggest city in Poland, Poznań. Poznán is a centre of trade, sport, education, technology and tourism and an important academic city with about 130,000 students and the Adam Mickiewicz University - the third largest Polish University of Poland. We visited a few places, such as Cyradela Park which was so interesting and well worth the visit. The weather was +20 C which was so nice. We enjoyed walking in the park and also exploring the city and all it had to offer, it was just amazing. We are very close to finishing our beautiful adventure here in Polish. Today was a bright day and it seemed as if we are in the middle of the summer. We had a nice walk to work in the fresh air. 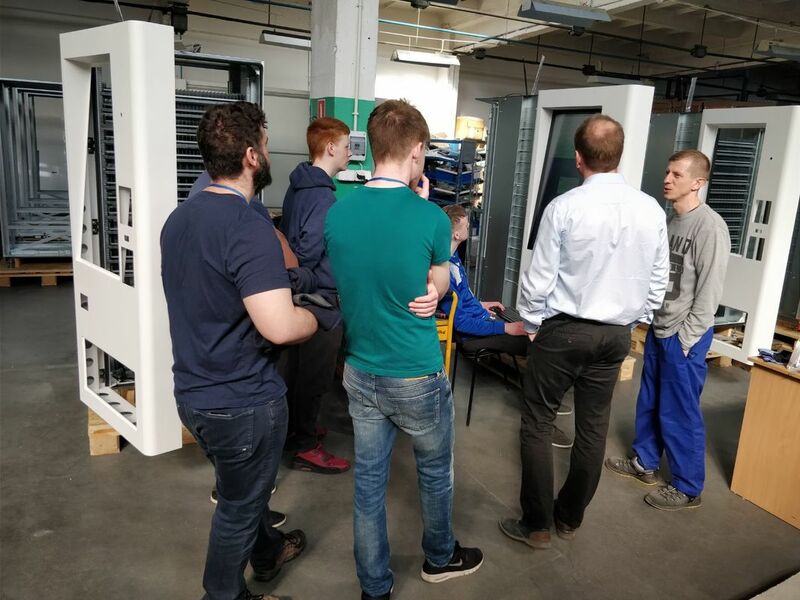 Today we went to an exhibition at a Polish Technical High School, where they were showing the different projects that they were working on during the year. The school and Zap company give prizes and diplomas to those who did a god job with their project. The students then have the possibility to go straight to college and they do not need to do any exams to get into a higher education course of their choice. There were many interesting and great projects that combine code, physics and electronic. The most interesting projects were ones you could make music with, by touching lasers and transmitting music through a laser. Other projects included, a solar panel which powered a pump, which means it uses clean energy for free. There were a few 3d printers used to drill metal and other ones to print a hard plastic of all types of plastics and colours. This can be used to create objects to use for demonstration purposes, like human bones or engineers metal blocks. We could see that the community helps the students with the project. Zap and others shops and companies sponsor this exhibition and help the students to realise their projects and their future. Overall every project had something interesting and you could see the hard work that went into them. We could see that there is a high level of education here in Poland and they have great minds, with bright futures. Another beautiful morning here in Ostrów Wielkopolski. We got up at 8am to begin another day at work. We headed to work at around 8:30am and went straight to our room where we had been the past two days. Jurand asked us to finish the models we were working on from the previous day. He gave us more sketches to build inside Solid Edge and had asked us to finish it all before the end of the day. We began taking a look at the new objects he wanted us to build and he talked through it. We began to work away at them, and by the time lunch time had come around and we had finished two of the builds. We went for lunch and reflected on our work, giving tips to each other on what we can do to improve our models. ​After lunch we went back to the room and got stuck into our work and had it all completed on time. Jurand inspected the work we had done and he was pleased with it overall. He also gave us some tips that would help us become a lot better at using Solid Edge going forward. He informed us that we would be going on a tour later on in the day. He said he would pick us up later on and bring us to museum that is half an hour away from Ostrow. We finished work and headed back to the Platan Hotel to prepare, as Jurand would be picking us up. He arrived and we went downstairs to meet him and his friend, who had joined him. The Museum we were heading to was formally a palace that belonged to a general to the last King of Poland. We arrived and headed to the main building where we met our tour guide. She brought us upstairs and gave us a brief history of the palace. We then followed her around going from room to room where she gave us the background of what each room was used for. The tour was brief and not as long as expected but it was full of information and we were happy with the experience. Our guide invited us to walk around the area and see the garden that surrounds it. After we completed our walk around the area we headed back to the cars and went to get something to eat. Jurand brought us to a lovely restaurant, that made great food in large portions. After our meal, we headed back to Platan and thanked Jurand for the wonderful experience he had given us today. Tomorrow we are back to business for our second last day of work. Where has the time gone?... This week has been very good and I am thankful for this experience we have been given. I feel that all of us have improved our language skills over the past few weeks and we are looking forward to the last few days. Tuesday: Hello from Poland...We woke up to today to lovely weather which reached 23 Degrees. When we arrived at work we met with Jurand and he gave us three sheets on paper with contained a blueprint of three objects and a dice which we had to make on Solid Edge. We sat down and problem solved how to make these projects. At first I found it very challenging but then I starting to play around with some of the features and starting figuring out what their functions were. For the dice, I starting by making a cube shape. Then I added making some holes for the numbers (see images attached). We then moved onto the next object, which was a component part of a bigger object. It was a bit harder to model than the dice because we had to match the model to the measurements on the sheet provided. I was the first to complete this object because the rest of the group were finding it difficult to make the shapes. When I was finished I took time to help some of the others in the group to make the shapes. After I finished helping everyone I started the next object which was a lot harder than the previous one. I made my shapes using different features of Solid Edge. After the I finished that one, it was too late to complete the last object, so we agreed to finish them tomorrow. Hello again from Poland. Today we started a new week at Zap, this time we are in a new area with a new set of challenges for the group to take part in. This week we will be in the manufacturing area of the company under the supervision of one the managers, Jurand. He wanted to show us how to use 'Solid Edge', a CAD a program which can be used to graphically sketch any project that someone might want to design. These sketches can be programmed into a machine which will create the design according to the measurements which the designer has put into the sketch. Before we started with solid edge, Jurand gave us a tour of the area of the factory which he is in charge of. It was fascinating to see the various machines, for example one machine punched holes in sheets of metal while another used CO2 and argon in a laser to cut certain shapes in the metal. All of which are then bent into shape using machines which have 250 tonnes of force, it was absolutely incredible. These parts are then polished and assembled by line workers. After assembly and sometimes before assembly, these parts are powder coated for protection from the elements. We were able to see the process from beginning to end and again it was truly fascinating. Towards the end of our tour we came to an area where the workers were assembling and finishing vending machines for contact lenses and safety gear. These machines use nfc cards to vend their items, which is quite advanced technology which I had not seen before, only on the internet as a “futuristic” concept. We ended up helping the workers with an issue they had on the operating system of one of the vending machines. It was quite satisfying to help them with their problem. After our tour we spent much of our time installing and setting up Solid Edge, and so we did not have much time to practise on it. Tomorrow we will have the entire day to work on it so I am I excited and look forward to seeing what we will be able to do with it. This weekend we had planned to travel to Krakow to explore it's sights and culture. We bought the tickets from Ostrow Wielkoploski to Krakow, and because I have the international student card I got the advantage of getting a 51% reduced fare. When the conductor asked me for my ticket, he also asked for the international student card and he said that students should be no more than 26 years old. Unfortunately, it turned out that I had to pay the full amount for my ticket. On our arriving in Krakow, I gave back the ticket to get my money back and I asked the conductor what is the purpose of the international student card. Unfortunately, the international card only works if you are a Polish citizen. In the morning we woke to beautiful sunshine and we began our day by going into the city centre. When we arrived we had a beautiful breakfast, and sat out in the beautiful weather which reached temperatures of up to 21 degrees celsius. The city was full of people and had such a beautiful atmosphere. Afterwards, we went to the shopping centre. Due to the new rules implemented in the country, every second weekend all the shops are closed with exception of the ones that are serving food. Overall it was a great day and it was so interesting to explore Krakow. We boarded the train home, which took four hours. I am looking forward to next week, and the new challenges at Zap Kooperacja. This will be our final week in Poland. Hello again... Today was little bit windy in the morning in our town after a few days of good weather. It’s our second weekend here in Poland. Early in the morning we got the train to Krakow, and this time we were not afraid of taking the wrong train because we already had experience of using the trains from our last journey. During our journey, we were able to see all the beautiful countryside of Poland. It was just amazing, with an infinite spread of land with grass, houses and beautiful forest scenery. When we arrived in Krakow (Glowny station), we were all stunned by the architecture and the mall, Galeria Krakowska. We had our lunch at a Polish restaurant inside the mall (Polish pierogi with kotlety) and it was just amazing, 'Pierogi' are like dumplings filled with onion, potato, cheese etc., and the Kotlety were similar to meatballs. It was interesting to try the local food. When we left the mall, the weather was so lovely, 21 degrees celsius and we were all stunned by the view we saw. We were so excited and started to explore the area. We passed through a square called “Plac Jana Matejki” and it was just beautiful. We walked all the way to the hotel that we had booked and also saw the main square “Rynek Glowny”, and it too was just stunning. We went back to the hotel to freshen ourselves up and then headed out to the one of the best landmarks in Krakow, “Wieliczka Salt Mine”. We were all so excited from the view we saw when we were inside it. The walls inside the mines are made up mostly of salt. The Wieliczka salt mine reaches a depth of 327 meters and is over 287 kilometres long. There was a big chamber made to look like a church, along with a lot of statues and figures. There are also many chapels that the miners had built throughout the years. They showed us how the mined material was transferred from level 1 to level 2 with a mechanical pulley system, which required 8 people to pull in order to move the machine and transfer the salt onto a different level of the mine. After we finished there we returned to the town and we continued to explore the square and surrounding area. I can’t wait to see where our journey is going to lead us tomorrow. It is a sunny Friday in Ostrów, and it is our last day in the department of programming in Zap company. Overall, we had a very interesting day. Today we learned about the security that websites and networks have to use and why these systems have to be in place. We also tested different tools on Windows and Linux operating systems to make sure that the websites and networks are secure and don't have any compromised leaks. This proved to be an interesting task. We also saw different websites which give the user access to see video from cameras around the world that are connected to an IP without any security. This means that anyone can check these cameras for any purposes. It makes you aware of the importance for people to secure themselves online, with so much access being readily available. What we learned today is that, with these cameras if your IP is left open to the public, this can allow anyone to watch it at anytime. It can be really dangerous if we forget to put the necessary security measures in place. We also had a lovely lunch in the company canteen consisting of white fish with fries and sauerkraut. We are looking forward to the weekend because we are going to Krakow, but don't worry we are going to tell you all about this adventure soon... Have a great weekend. Hello from Poland... Today we began our day bright and early as usual. We left our hotel at 8:30am to make it to work by 9am. The weather was beautiful so the walk to work was so nice. We arrived at 8:50am and headed upstairs to meet Daniel. We went to the room we have been working in for the past few days. Daniel discussed with us that we would start making a game to add to the websites that we had created the day before. We needed to download an application called 'Phaser', that would allow us to create 2D games and add them to our websites. Daniel gave us a quick tutorial on how to use the Phaser application. He showed us how to add images, sounds and animations. Daniel gave us a task to create a fully functional game with all the attributes he had thought us. He gave us 3 hours to complete our games and wanted us to ensure the game meets the criteria. We began to start coding our games and started to look up sounds and images on the internet that we can add to our games. After we were finished we took our break for half an hour. We discussed what we had done with out games and gave suggestions. After our lunch Daniel wanted to show us how to progress our games more and add some finishing touches. We finished up and headed back upstairs to the room. Daniel began to show us what we can add to complete our games. He was talking to us for about an hour and told us to go use our new tips and add them to our current project. He gave us the rest of the evening to finish our project. Daniel was on hand to help us if we had any questions. We finished our games and Daniel want to inspect them to see what we had done with them. He told us what we had done good and what we can improve on. After all that our day was finished we thanked Daniel for teaching us the 2D game development. We return tomorrow for our last day in the programming division. We began walking back to the hotel in the beautiful weather it was like summer time. I enjoyed these past few days in the programming division and was hoping we could spend more time here as it has been the best part of this trip so far. I look forward to returning tomorrow and back to learning new things in programming.